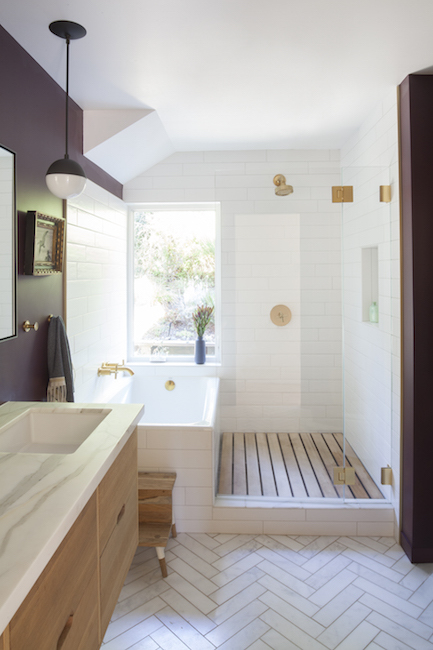 A small room like a bathroom is the perfect place to make bold design decisions. I think restaurants have figured that out, and are trying to outdo each other to make ever more photo worthy powder rooms. When Nick and I lived in Mill Valley we had a small half bath that we painted in Farrow and Ball's Arsenic (a bright minty green color) and covered in photos. It was the strangest little room ever and my favorite in the house. For our main bathroom in our new house in Woodacre we wanted to push all the boundaries, which it turned out was just warming us up for the rest of the house. We knew we wanted our floors to look old and well worn, like centuries of Romans in lace up sandals had tromped through on their way back from the dusty gladiator pits. We picked marble tile, laid it out in a herringbone and used a dark sand colored grout. 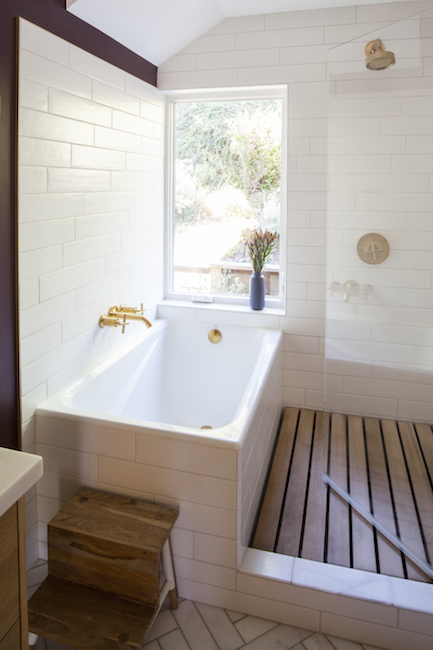 All of the fixtures are brushed gold from Kohler, and the deep compact soaking tub was inspired by our contractor who lived in Japan for quite some time. He made the cedar slat wood floor for our shower as well. But what's up with that color? My dear friend who used to be a house painter had always obsessed over this color and got me thinking hard about it: Brinjal from Farrow and Ball. It's like an incredibly rich and dark eggplant skin, with a luxurious depth to it. I almost chickened out once and went with something totally benign, but luckily pulled myself out of it. I mean, what the hell, it's just paint! Granted, it will take ten coats to paint over this color, but why worry about the future now? I'm just going to go ahead and enjoy the heck out of my damn purple bathroom. And if you are passing through town and your bladder is screaming at you, you are welcome to come enjoy it as well.